This bunny may have chocolate tones but being cast in solid bronze it is definitely not edible. Thinking of Easter bunnies, I followed Alice down the rabbit hole also known as the internet to research the origin of this Easter custom. Dependable Wikipedia sets out how the rabbit or rather the hare has possibly several ties to pagan times and has been associated with Eostre the goddess of dawn whose torches may have been carried by hares. Hares it seems have been celebrated by many from prehistoric times onwards as creatures of spring that herald lighter longer days and fertility to crops and mankind. Our bunny door knob has more earthly origins and is based on a soft interpretation of this very soft animal. As a nod to the preferred diet he/she sits on a wreath of swirling vegetation all of which is cast in solid bronze and typically finished in a light antique brushed and oil rubbed patina. The bunny shape was designed so that all the legs and ears are tight to the body thereby making a round and compact door knob that fits easily in the palm of one’s hand. The bunny design is one of 4 nature inspired door knobs that collectively make-up our Netsuke collection, a collection whose namesake is the compact toggles used to fasten clothing. The Netsuke collection is interchangeable so a rabbit and frog or lizard or bee can happily co-exist on the same door, one on each side of the door. The netsukes can also be mounted on different back-plates to create a truly eclectic interior. This has been the most remarkable spring but the arrival of a swarm of bees was as unexpected as it was spectacular. On Sunday we heard loud buzzing from our front garden and spent the next hour watching the process of hundreds of bees settling in our Brazilian Pepper Tree. What began as a few bees over the next hour became a mass all huddling together to protect the queen. By evening the swarm had settled in and become calm as the temperature cooled and their rest time commenced. While we knew that the Queen was at the center of this colony, we did not fully understand why this event had occurred so turned to the internet. The queen increases the size of the colony by laying eggs that become worker bees and so the colony grows until it eventually it out-grows the hive at which point the queen lays a few queen eggs. The queen then leaves the hive before the new queen bee hatches and takes with her about half of the worker bees to journey onwards to begin a new hive. We were lucky spectators at the point where the queen and her followers had set out in search of a suitable location for their new home and had decided to rest over-night in our tree. At no point did the swarm pose any threat to us as we passively looked on from a safe distance remaining still save for the photos we took. The following morning the queen and her entourage waited to be warmed by the sun before continuing on their quest. I was inspired by the sight of these live bees to create a playful collage using our polished bee door knob with a back-drop of dark honeycomb roses which is the most well-known handle set from our Netsuke collection of animal door handles. 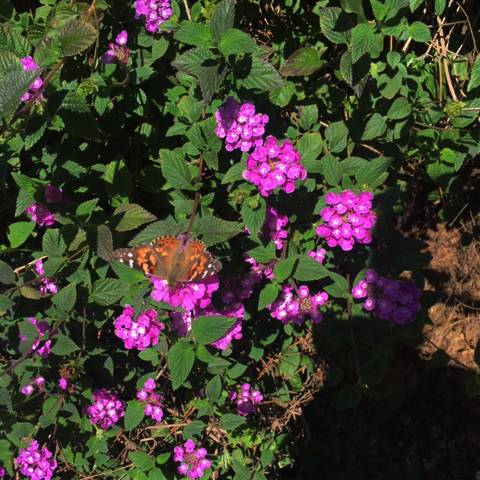 Like so many in Los Angeles we have been stunned and are “gob-smacked” at the multitude of Painted Lady Butterflies that we have seen this week. These small pretty insects are everywhere but only once has my iphone been to hand to snap a couple of shots. While the monarch butterfly is sadly in rapid decline, for this year at least, the Painted Lady population is booming with billions passing through on their way north from the Mojave Desert. The exceptional rains that have put a temporary hold on California’s drought have given rise to an abundance of nectar as food for these migrating beauties. The short life cycle of a butterfly consists of 4 stages from egg, to caterpillar to pupae and then to butterfly and for the Painted Ladies lasts about 4 to 5 weeks. I was surprised to discover that these small beauties can travel at speeds of 25 miles an hour and cover as much as 100 miles per day but this explains how they are able to make their trek from the Mojave to Northern California in their short lives. We have been inspired by butterflies as well as bees, wasps and moths in our collection of insect cabinet pulls. We also have incorporated a butterfly as the thumb-latch for our entry way lizard handle set. The Painted Lady captured here drinking from Clematis demonstrates this butterflies preference for purple clustered flowers, a fact observed by Katelyn Boisvert in her paper presented at the Young Naturalist Awards. This week I wanted to reach out to get feedback on whether there is a demand for LED door handles that are battery operated rather than hard wired. When we designed our handles and particularly the longer lit pulls finding an LED spot that was small enough to fit in a 1.5” diameter pull was a challenge but one that American Illumination were able to solve. We selected American Illumination as our supplier as the unit they make is well designed, compact and is ETL registered. The spot they make is hard wired which means it can only be used on doors which have been constructed with a hollow channel for the wires to pass or by adding an external power transfer unit. The installation drawing below shows how the wires are fed through the door to connect with our handle to light the LED spot. This method of installation is attractive as it is completely concealed with your guest’s focus being on the handle and not on the apparatus, but it is not well suited to the hobbyist or home owner looking for a simple way to add light and color to their entry door. Too date, I have not found a small enough battery that can power these very low energy LED spots for long periods of time and none that can keep the handle lit for a year or more so thought I would ask for suggestions from any of my readers. So, if you do know of a small battery that is 1” diameter and 2”H l would love to hear about it. We are expanding our collection of wine cellar door hardware and have just designed a small cabinet pull that will function more as a cabinet knob. The design was sketched by hand at full scale and from both the plan and front views. The vine knob at 2 ½”W, 1 1/2” was designed for cabinet drawers and as a complimentary piece to the larger 6 ½” vine pull. The small scale of this piece enabled Martin Pierce to carve it from a block of blue wax manufactured by Ferris® being a wax designed for use with high speed machines as well as steel carving chisels. The outline of the knob was drawn with a felt tip pen onto the face of the block of wax which was then cut out on a band-saw. The individual leaf segments and fine leaf outline were cut using a slow moving scroll saw. Martin then carved the fine veins and shaped the leaf contours using 3 types of chisel and an improvised hand scraper made from a band-saw blade. Many of Martin’s chisels were acquired when he was an apprentice wood carver and they were made by legendary William Marples & Sons in Sheffield, England. The chisels were forged from the finest Sheffield steel and they maintain their sharpness even when cutting dense hardwood. The rains have turned the area we live in into a beautiful landscape full of trees in blossom and nesting birds in what is still a dense but thriving urban environment. With the recent 3-day weekends we have been able to walk for hours in the Hollywood hills and were able to capture some lovely and surprising views. What is always startling is how quickly the grasses spring to life and turn the hills into a verdant intensely green landscape. While the Hollywood sign is a familiar view it is great to see it through a curtain of green leaves. The bottle bush trees are a familiar sight but when in full foliage they take on the character of a weeping willow with their fine dropping branches. In the Willow sprig pull these flowing tendrils are captured in molten bronze. The handles are available as either right or left cabinet pulls but, in the photo, we accentuated their weight by superimposing these 2 handles. 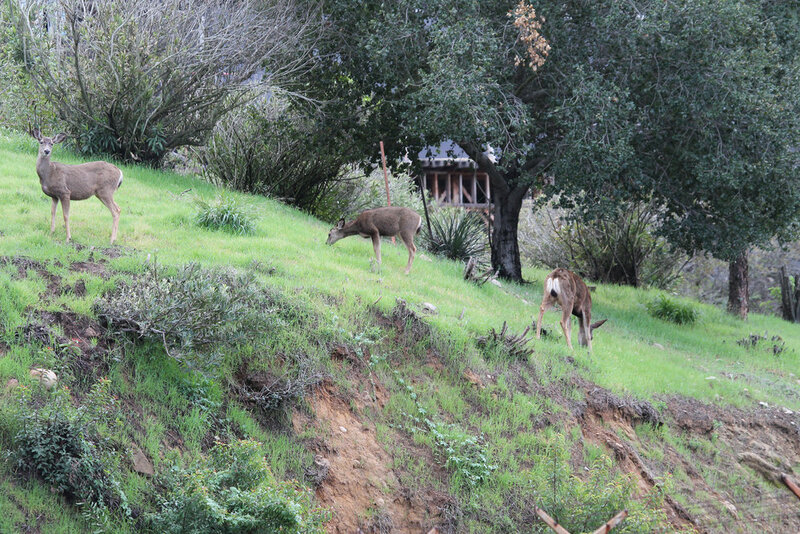 Mule deer also reside in these hills and we saw whole families of them grazing happily on the lush vegetation. 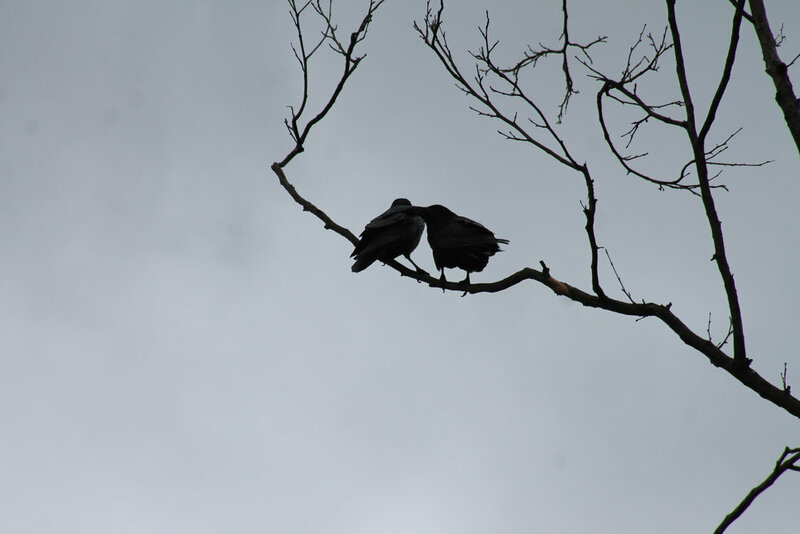 We spotted a pair of ravens preening each other whilst perched on a bare sycamore branch. Several of the photos were taken from the vantage point of the Hollywood reservoir which is also a great place for bird spotting as it is frequented by herons, egrets and the occasional osprey. Silver and gold are unusual choices for cabinet handles but when integrated into a credenza design they can become the finishing touch. Our first silver plated pulls were commissioned by interior Design Anna McPherson when she was with the international developer Candy & Candy. On that occasion we silver plated our dragonfly, geckos and frog handles. 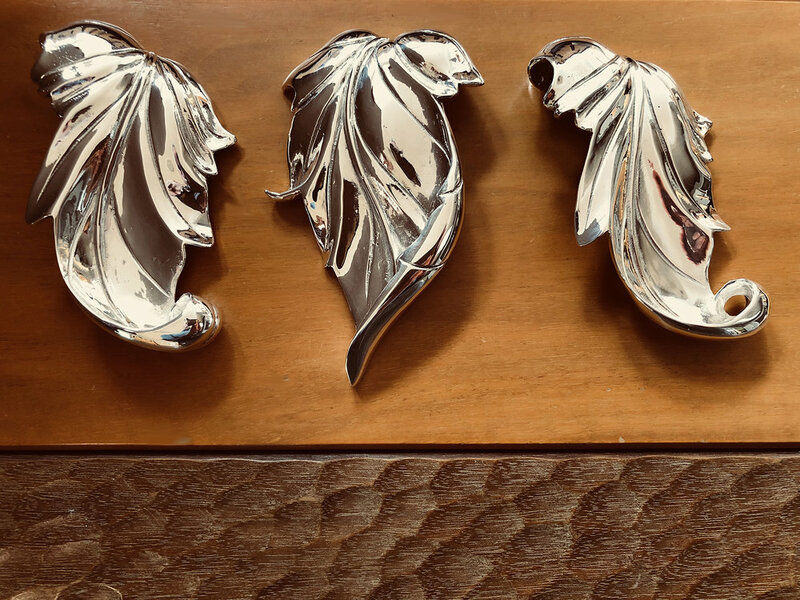 More recently Anna has used silver plating to add sparkle to our sycamore leaves for a custom credenza being made by the furniture craftsman, Thomas James in Worcester, England. 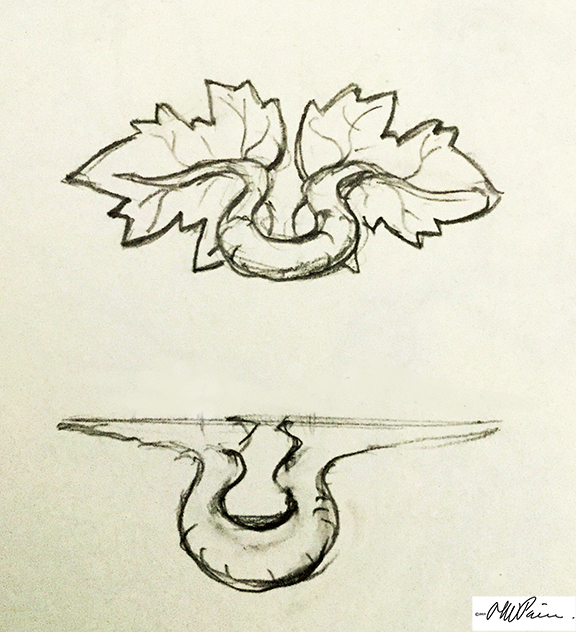 While Martin Pierce designed these leaves to function as left and right pulls, each was made as a unique cabinet handle, reflecting the reality one finds in nature where no 2 leaves are identical. The first sycamore leaves were made for the Ascot armoire, a limited edition piece that Martin Pierce Furnishings our sister company makes. The armoire as you can see is decorated with a scene of autumnal leaves rendered in gold leaf and glazed with layers of translucent pigment. The handles were simply buffed and left as natural bronze to provide a subtle compliment to the leafy scene. To add depth to the bronze leaves we add a dark patina to the buffed metal and re-burnish select areas on the edges and higher sections and then we oil and wax the surface to help fix the finish. For a more dramatic colorful finish we use a brown chemical patina which needs to be applied to a hot surface which we achieve by heating the piece with something akin to a blow torch. Our work in the Post Oak Hotel in Houston began in spring 2015 and culminated in our designing and manufacturing 3 unique door handles. The design process was a collaborative process and we were fortunate to work with Gensler in Houston and their wonderful creative team of designers and architects. The braid handle was inspired by an image of a chain bracelet that the Gensler team were using as a starting point. The interlocking woven nature of a gold chain was re-conceived by Martin Pierce as rows of braided rope that would ensconce a rod of solid steel. The alternative handle “ribbon” was a more abstract design loosely based on vertebrae and building blocks. In posts that follow we will be sharing photos of these pieces and will continue to discuss the other original handle designs made for this luxury hotel. Starting a new year always provides impetus for new designs for our wide range of door hardware, lighting and now art. While the creative process lacks boundaries, the demands of work place requires that we treat these 3 areas differently, with “art” still being relegated to third position almost as an indulgence. This year we intend to indulge ourselves. Perhaps another indulgence but the scale of large door grips provides the opportunity to create some beautiful pieces. The brand of a hotel or resort can at once both inspire and restrain a design and that challenge is what makes custom commercial door handles fun to conceive and cast. As our door grips become longer so too do the illuminated Morphic door handles. These organic lace- like handles will be customized in 2019 to offer a range of lengths from 16” to 64” and we are experimenting with a version of this handle that would have alternating sections of steel and bronze. It has been quite a bustling creative year making door handles and creating a wide range of custom door hardware. Our work took center stage at the Gensler designed Post Oak Hotel in Houston with large lace and oak styled handles for the public areas and braid inspired handles for all of the suites and we will be sharing more of this project’s highlights in early January. Martin’s raven has taken a back-seat to the demands of these large projects but I am pleased to report that the raven mold has been created and his first red wax replica has emerged. We look forward to a creative 2019 and wish you all well. 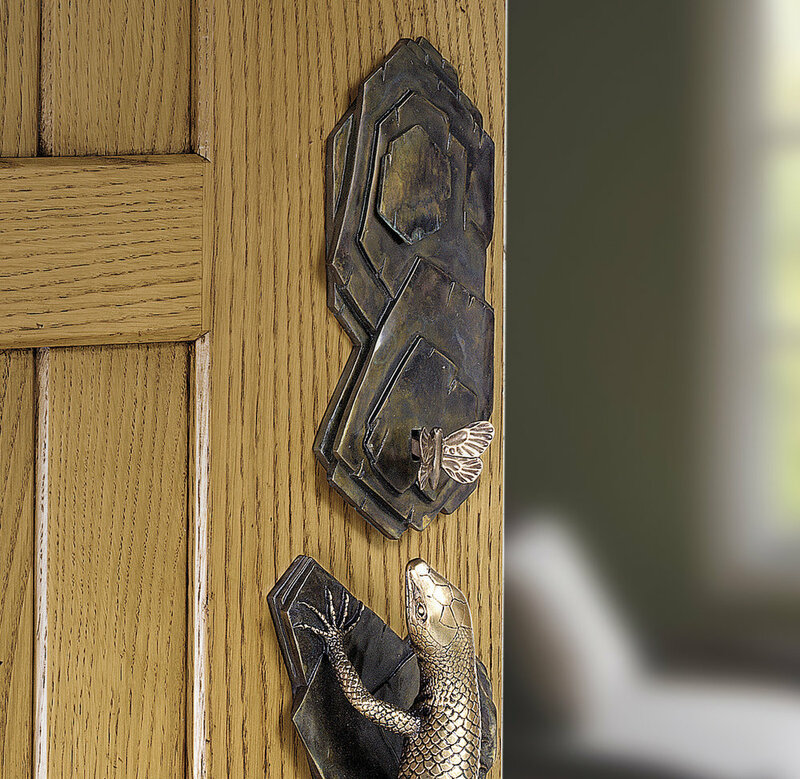 As befits a magician, James strayed from the path of “sameness” and instead conjured up a fun set of door handles using the animal knobs from our netsuke collection and the swirling leaf escutcheon plates from our willow collection. The results were beautiful and whimsical and could well have been illustrations for a children’s book. The sets were cast in solid bronze and finished with a dark antique oil-rubbed patina. Each piece was burnished by hand to highlight the bronze tones of the raised sections making the leaf veins and wing and ear details more pronounced and creating a sense of depth through the contrasting light and dark areas. We have mixed and matched our door styles for other clients and readers will recall the willow knob being used as an entry set with a medium bark back-plate in a very creative residential remodel by Los Angeles Designer Bonnie Mcintyre. We have in the past discussed the pros and cons of using 3d printing in the casting process and return to this topic to describe our most recent commission. The willow door knob was featured in the last post and coincidentally it is this piece that inspired the current work. While it is technically a door knob it’s scale is regal and it was designed to take center stage as a dramatic door statement. 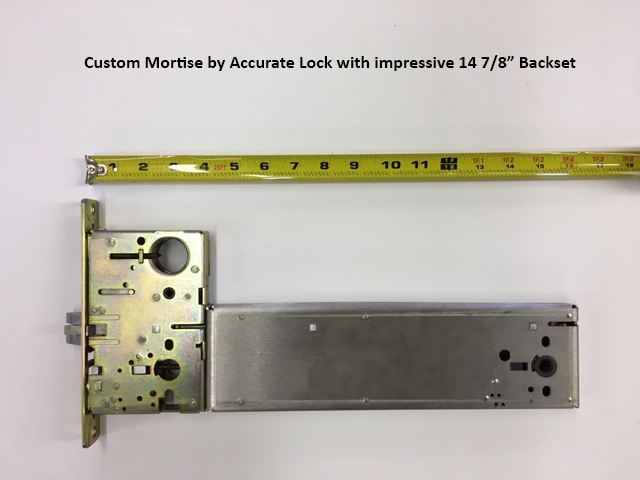 When first designed the piece was intended to be used as non-operative pull that would be used to open an entry door but with a separate thumb latch trim operating the door latch as is shown in the photo. In European doors particularly in the baroque period such grand knobs often fully functioned to open and close the door and a local artisan would fabricate a mortise latch for a very deep back-set to reach the center of the door. With this in mind the second Willow knob was designed in 2 pieces with the knob being separate from the back-plate and mounted on a spindle that can be rotated to activate the door latch. The current commission uses the same concept but the style of knob is simpler with no filigree and is designed for a less ornate setting. The Willow knob being elliptical and with many layers of filigree was carved over a period of weeks. Our commissioned knob needs to be made from design to delivery in 10 weeks and will be cast in stainless steel. As the piece is symmetrical circular and as we have a great pool of lathe artisans in Los Angeles we have found that it is faster to slab up a block of wood and have it turned on a manual lathe rather than 3d printed. Intricately detailed bronze door handles cast in investment caliber bronze are our hallmark but often these details go un-noticed. 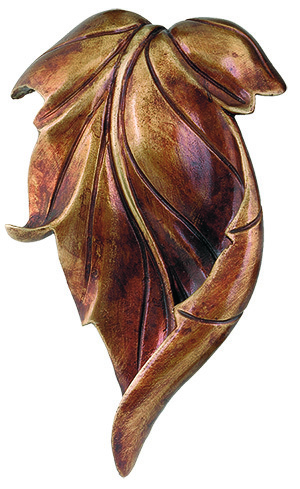 The Willow heroic door knob is the signature piece in the Willow collection of bronze entry and interior door handles. Cast in bronze the entwined leaves are finely detailed to create a veritable vortex of swirling filigree. Made in 2 sections the backplate alone is 6.5 lbs. with the center a further 2.0 lbs. making a total of 8.5 lbs. of investment grade bronze. While bronze may not be as precious as gold it still holds its value over time especially when artistic value is added. This door knob is 11” tall by 7” wide and 4” deep (279 x178 x 102mm) and its scale deservedly gained it the title “heroic”. The Grapevine large door is sizeable at 3"W x 4"D x 42 ½"H (76 x 102 x 1080mm) and contains 11 lbs. of bronze. There are some small difficult to spot details in this piece that remind me of Gringling Gibbons the legendary 17th century Royal wood carver whose works are world renowned for the amount and depth of his relief carvings. Gibbons is known for his 3-dimensional carved leaves, flowers and berries but he also carved more lurid hanging fowl and human skulls. While free of human bones the Grapevine pull does have the odd beetle so may not be suited to those with an insect phobia. For the collectors among us this statement piece is part of a limited edition of 100. Fibrous gnarly tendrils of bronze cling to the center stem. We really enjoy working with creative designers and Bonnie McIntire is one of our favorites in this select group. A couple of years ago we had the pleasure of working with Bonnie and created a hybrid entry door set that combined the willow and lizard collections to produce a Willow Bark entry knob set for a Bel Air residence. This was not an obvious combination of styles, but the result was a playful balanced pairing. The Willow theme continued through to the kitchen where willow cabinet knobs provided the stopping point for rows of hedgerow branch pulls. While the branch pulls functioned well as pulls for opening drawers, one bank of drawers were situated in a high traffic area where there was little room to pass and to reach the upper cabinets. 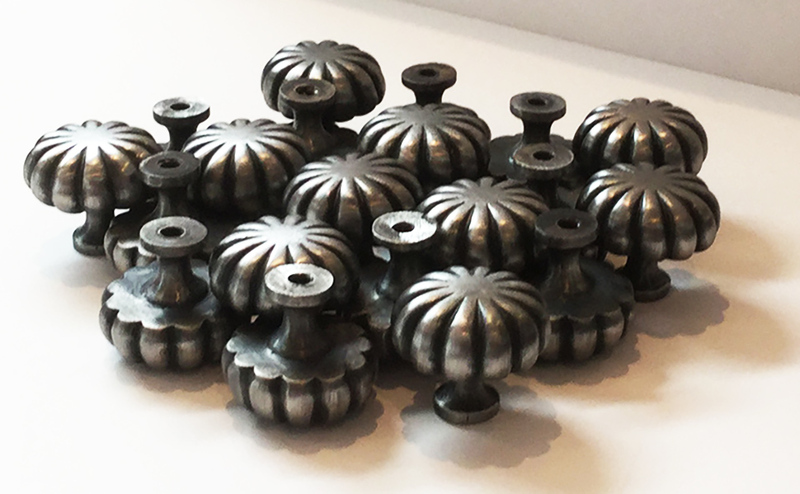 Unlike cabinet knobs, pulls are generally not self-contained and often the end of the pull for aesthetic balance extends beyond the mounting post and can in confined areas catch on tea towels etc. When we cast our pieces, we make a wax model and if the number of pieces is not daunting we can make modifications to each wax piece at this stage before the pieces are shelled and cast in bronze. In this case we shortened the top of the pull so that it ended at the mounting post and re-worked the textured indentations and shape to retain aesthetic balance. The result will be a pleasing variation of the branch pull and one that will work with the existing screw holes. If the number of pieces or the amount of labor had been greater then we would have made a new original to incorporate these changes and then created a new mold. We will keep you posted as we proceed to cast these pieces in bronze. Being a product of the 50’s and later being influenced by the 1960’s mod culture I have often used the adjectives modern and contemporary interchangeably and see that many search engines also assume these terms are synonymous. The Morphic serpentine door pulls when cast in stainless steel do appear a little alien and while the first film in the alien series is one that Martin has seen countless times the lead alien was not a model for this pull. Perhaps the offspring of the alien may have had a more direct impact on the Morphic door knob. Thankfully the more “modern” Ergo lever has it’s roots in the art nouveau period. We were recently commissioned to replicate cabinet handles from the 1920’s for use in other areas of a home being renovated. It was not possible to establish the base metal used for the originals without damaging the pieces and our best guess was possibly the castings were made in pewter or nickel. While the metal alloy did not impact our ability to replicate the shape of these 3 cabinet pieces it did present us with interesting patina and finish choices. We began the project by carefully cleaning the originals so that we could get a good impression in our latex rubber mold. As the pieces were small simple shapes we were able to make a single two-part mold that would accommodate all 3. We could have made individual molds for each piece but given that we were making less than 50 pieces this would not have been cost effective. We made a simple mold and after cleaning the originals sprayed on a release agent making them easier to later extract from the latex mold. The photo below shows the red waxes that were made from this type of mold using Westech’s V510 wax V510 that has melting range of 185° to 195°. The originals were made for different screw threads, but the replicas need to suit modern needs so were drilled and tapped for a uniform 8-32 threaded screw. Stainless steel is an excellent durable alloy but needs to be heated when applying Birchwood’s M20 dark patina. As an added measure we baked the pieces in a clear matt enamel to protect the patina and give a very subtle sheen. As a brand that specializes in unusual custom hardware we have over the years created unique door handles for hotels and luxury homes, but this year marks our first venture into designing door handles for a private observatory. When contacted by LM Design Group, an international Los Angeles based design group we did not appreciate that the sketch they provided of moon handles was for an observatory for an overseas villa. The commission came at an opportune time as we had obtained UL approval for our new line of illuminated handles and were able to take this technical know how and configure the LED lights to work inside a concave moon fixture.In a previous post we shared a short video showing how Martin carved and hollowed out the concave basswood pattern that was the base for the door handle. The pattern was coated with a ¼” of gesso which formed a surface that could be carved to create moon craters and stylized moon texture. The image below shows the pattern after carving the gesso was sprayed with a grey color before being carved as the natural white gesso is to reflective making it difficult to carve as depth is more easily judged on a colored surface. The image to the right shows the same approximate area as rendered in bronze and finished with a dark antique M20 patina. While the original design was to be open with light shining through to the bronze back panel the client preferred a softer light, so we added a custom plexiglass diffuser.